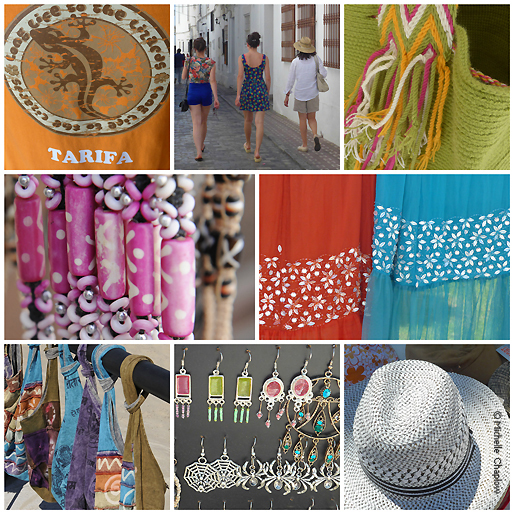 Tarifa´s shopping scene is as varied as the crowd who frequent the town. Classics like the indoor fish market and touristic souvenir shops are balanced with the wave of boutiques that have begun to colonise the old town to cater for the hip surfing set. The result occasionally feels like a clash, but captures the spirit of old and new which so characterizes Tarifa. The Mercado Publico de Tarifa sits right on the edge of the walled old town, on Calle Colón. The exterior of the building is whitewashed, with a Moorish vaulted archway as the entrance. This leads into the fish market, which is always packed and sells a huge variety of catches from the Straits of Gibraltar and beyond – it´s a real show of colour and freshness. The inside of the market is arranged around a large, sunlit atrium, which is cloistered with painted brick archways. Several cafes occupy this space, putting out seating for customers. There are some daily basics like a home cleaning supplies kiosk, and a florist which sells simple potted plants for as cheap as 3€. Outside of the main town, on Calle Batalla del Salado, is Tarifa´s Mercadona, one of Spain´s cheaper supermarket chains. It´s a 15 minute walk from the centre. Most of the designer surfwear shops are located in Barrio Nuevo, on Calle Batalla del Salado, and on the N340 coast road north of the town. Fashion outlet stores, offering great reductions, can be found in the poligono industrial (industrial estate). As well as renowned brands like Quiksilver and Big Fish, there are lots of independently owned stores selling surf and beach gear. Big Surf, on Calle Batalla del Salado, sells wetsuits, body boards and summer fashion items. This is a good place for kitting out the whole family ready for beach season. Its lime green exterior can´t be missed. Bellini Kite and Surf has a similar catalogue of products, but aimed at a more specifically adult market. They also sell full length surf and SUP (Stand Up Paddleboarding) boards. The store´s founder, Eduardo Bellini, was once a champion kitesurfer himself. Wet Tarifa Focuses more specifically on the sporting element of surf culture; they sell a variety of boards, wetsuits and accessories. You can even purchase fatbikes here – bicycles with very thick tyres which can be ridden on the sand. The kitesurf scene in Tarifa has undeniably brought in a new younger touristic crowd, and the town´s retail community has had to quickly adapt to this with a variety of boutique home and fashion stores. Boho is a good example; taking beach-inspired cuts and summer wear as its starting point, the store has also taken inspiration from world fashion to produce unique pieces – think tassles, zigzags and paisleys, all done with great taste. Divina Comedia brings a more distinctly designer edge to town. With a pastel pink exterior, this women´s fashion brand sells a minimal selection of expensive pieces, displayed elegantly, and all maintaining Tarifa´s idiosyncratic summery style. Arena is more traditionally bohemian. Sitting just outside the old town, the store sells expensive but very high quality unisex hemp shirts, small homeware pieces and a big variety of silver jewellery – all displayed on boards in the style of the Moroccan souks. Taking inspiration from across the Straits is common elsewhere in town; Etnika is a tiny bric-a-brac store selling Moroccan lamps, ashtrays and other home pieces, all stacked up haphazardly on top of each other. Despite the increasing number of boutiques, there are still multiple options for purchasing cheaper tourist souvenirs. An unlikely example, the tobacconist on Calle Sancho IV el Bravo actually sells a nice selection of shells, nautical inspired pieces and postcards. Tarifa, like most Andalucian towns, has small kiosks on most corners which sell postcards, newspapers and candy. 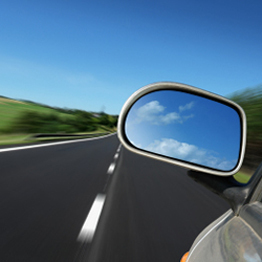 These can also be a helpful reference point if you find yourself lost. For a more unique souvenir, the Atlas Beach Gallery is a modern, stylish space in which photographic prints of local beaches can be purchased. Manuel Caminero, art director-turned-photographer, focuses his work on Tarifa and its environs. Prints are available in multiple formats, including some as phone cases. Mercado Publico de Tarifa (Calle Colón, 5): open daily 6.00 – 18.00. Closed Sunday. Mercadona Tarifa (Calle Batalla del Salado): open daily 9.00 – 22.00. Closed Sunday. Big Surf (Cl.Batalla del Salado 86): open daily 10.30 - 14.00 and 17.30 - 20.30. Closed Sunday. Bellini Kite and Surf (Calle Batalla del Salado, 30): open Monday - Saturday, 10.30 - 14.00/17.30 - 20.30 and Sunday 11.00 - 14.00/17.30 - 20.30. Wet Tarifa (Polígono Industrial La Vega, Nave 208): open Monday - Saturday 10.00 - 14.00/18.00 - 21.00 and Sunday 11.00 - 14.00/18.00 - 21.00. Boho (Calle Sancho IV el Bravo, 7): open daily, 10.30 - 21.30. Divina Comedia (Calle Ntra. Sra. de la Luz, 5): open Thursday, Friday and Sunday 11.00 - 14.00, Saturday 11.00 - 14.00/17.00 - 20.00. Closed Tuesday/Wednesday. Arena (Calle Batalla del Salado, 10): open daily, 9.00 - 22.00. Atlas Beach (Calle Santísima Trinidad, 20): open daily, 11.00 - 14.00/18.00 - 21.00.